The American Civil Liberties Union of Maine filed a lawsuit Tuesday, May 8, 2012 against two former guards at the Cumberland County Jail. The lawsuit alleged the guards beat a man from El Salvador being held for deportation. 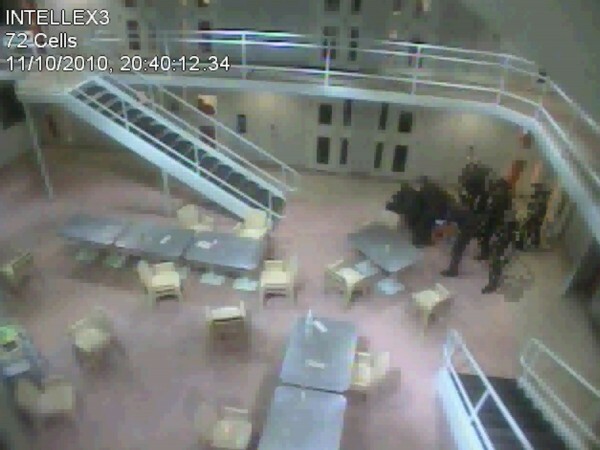 This photo, taken from a November 10, 2010 surveillance video, shows a group of guards who appear to be helping to restrain the inmate. PORTLAND, Maine — The American Civil Liberties Union of Maine Foundation on Tuesday filed an excessive force lawsuit in U.S. District Court against two Cumberland County Jail guards on behalf of a man who has been deported. The complaint alleged Wilmer Moreno Recinos, 32, of El Salvador suffered “substantial long-term physical pain as well as anxiety and other psychological harms” as a result of injuries inflicted by Glenn MacDonald and Steven Pyle on Nov. 10, 2010. The ACLU of Maine did not sue the jail or its administrator over policies or practices in place. Recinos was being held in the 72-hour unit at the jail in Portland after being arrested earlier in the day by local police for an immigration violation, according to the complaint. The alleged beating occurred about 8:40 p.m. Nov. 10, 2010, when the two guards were escorting Recinos back to his cell. Recinos, who gave jail officials a list of allergies when he was processed into the facility, approached the guards after suffering symptoms of an allergic reaction, according to the complaint. He asked to go to the medical clinic and the guards refused. MacDonald was suspended for one day over the incident, which was captured on the jail’s security system, but Pyle was not, according to the complaint. Pyle still works at the Cumberland County Jail, Sheriff Kevin J. Joyce said Tuesday. MacDonald has moved out of state. Joyce said that the men most likely would be defended by attorney Peter Marchesi of Waterville. He will have 21 days after he receives the complaint to file an answer. As a result of the alleged beating, Recinos spent much of his remaining months at the jail in the medical wing, according to the complaint. He continues to suffer from severe abdominal pain and difficulty eating along with anxiety, depression, sleeplessness and fear of his surroundings. The ACLU of Maine Foundation is seeking an undisclosed amount in compensatory damages, attorney’s fees and litigation costs. The suit claims the guards committed assault and battery against Recinos and violated the federal and Maine Civil Rights Acts by beating him. The ACLU and its affiliates have produced seven major reports on immigration detention in the last four years and have lawsuits pending over detention conditions at Immigrations and Customs Enforcement facilities in Arizona, California, Nebraska, Rhode Island and Texas, according to a press release issued Tuesday announcing the lawsuit.